It’s very tempting to promote a product, service or company by using popular buzzwords. The formula is simple: select popular buzzwords, string them together in a few sentences, and voila! Buzzwords can be appropriate and convenient. Even Apple uses buzzwords – calling the iPad “magical and revolutionary”. But 90% of the time, buzzwords are misused. And they often make us sound less credible. Think back to PowerPoint or Keynote presentations you’ve seen over the past year. 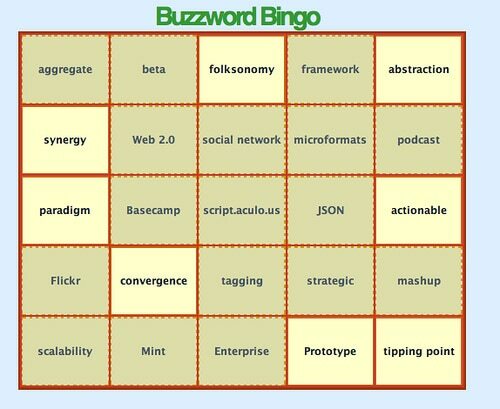 How many buzzwords were used in the presentations that you thought were most successful? Think about your favorite companies and websites and study how they describe their products and services. You’re not likely to find many that string together buzzwords to describe their products or services. I am personally increasingly sensitive to how I use buzzwords, because I notice that I react negatively when others use buzzwords in written and verbal communications. When I start hearing a string of buzzwords, I conclude that the person isn’t really communicating with me – they’re just stringing together a bunch of words for effect. There’s even a Buzzword Bingo game created to help pass time at corporate meetings! Do you react negatively or tune out the conversations when you hear many buzzwords? That’s the rub with buzzwords – if everyone uses them, they are no longer unique. Who cares if you have a ground-breaking or viral product if every single other company claims to have a ground-breaking or viral product? If your audience is tuning you out, your marketing or fundraising message will fall on deaf ears. There’s an easy solution. Talk with people. Cut the buzzwords. They are not necessary.